The Mint Julep is such a perfect, classic and historic bourbon drink, it seems silly to wait until Derby day to have one. Of course, as any aficionado of spirits will tell you, there are as many right ways as wrong ways of making one. And I enjoy the taste of bourbon in my Manhattans so much that I don’t really get a craving for a Mint Julep as often as one might think. The first step in my Mint Julep is making the simple syrup. I use the standard ratio of 1 cup of clean, filtered water to 1 cup of sugar, but I use an organic product like Woodstock Farms Organic Pure Cane Sugar. Place the sugar and water in a saucepan and heat until just boiling. I’ve found that it needs to reach this stage for the unbleached sugar to really dissolve. As soon as it starts to boil, remove the saucepan from the heat, and throw in a handful of freshly picked mint leaves. Stir to make sure the mint gets in there, and then leave the saucepan to cool to room temperature. Once it’s at room temp, strain the simple syrup into a bottle with a tight sealing lid, and place in the refrigerator to cool. It will keep for about a week. The next step is the tough part: the battles of the bourbons! The recent explosion of choices on the bourbon market has made it all but impossible for the average imbiber to know which bourbon is best for their tastes. My suggestion for this is to go to a trusted bartender and explain that you’re new to the bourbon world, and could you have the tiniest of tastes and sniffs of what he’s got at his bar. Chances are, you’ll get a sampling of some of the better known brands: Maker’s Mark, Woodford Reserve, perhaps Buffalo Trace or Bulleit, and the standard Jim Beam. This is a very good start. If you have deeper pockets, go to the manager of a trusted higher end liquor store and explain that you’ve had all the rest, now what does he think is the best? This is how I came across a fabulous 17-year-old bottle of Eagle Rare, my choice for my Mint Julep, though currently incredibly difficult to find. And of course, hinting to wife and friends that “I’m trying new bourbons” around your birthday or the holidays inevitably gets you a few bottles as well! And a Mint Julep needs a metal–not glass– Julep cup. Made of pewter or aluminum, it frosts on the outside as you stir your drink, keeping your beverage ice-cold on even the hottest of days. 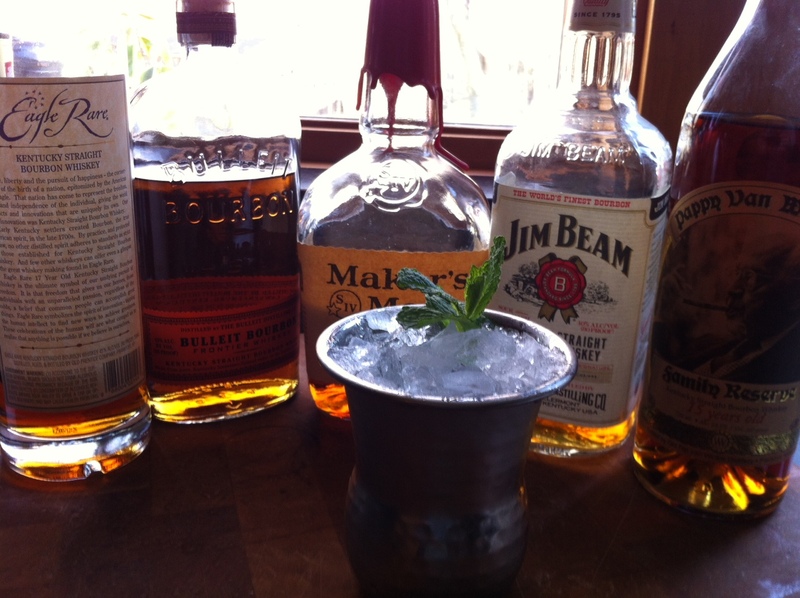 You simply need to have one to make the perfect Mint Julep. From left to right: the now hard-to-find Eagle Rare 17-yr-old, Bulleit, Maker’s Mark, Jim Beam, and the now impossible to find Pappy Van Winkle 15-yr-old. I like to add 1 jigger of bourbon (1.5 oz), then the shot of simple syrup (1 oz), then another jigger of bourbon on top. Break off a few mint leaves from the stem and push into the ice. Using a long spoon, stir the drink well. A beautiful layer of frost will form on the outside of the cup. Add more ice, if necessary, and garnish with a sprig of mint.